S&P is at key technical juncture. Current rally is testing formidable resistance at the 2500 zone. The longer the index stay below that level, the more vulnerable it is to lower prices. This is Capital Essence’s U.S. Market ETFs Trading Map – SPDRs Sector Report for December 31, 2018. 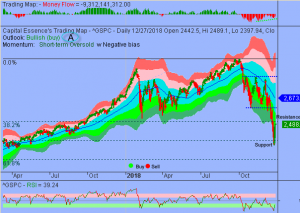 SPDRs Report is the daily, weekly and monthly technical overviews and analysis for major indices, key sectors, commodities ETFs. This information is a comprehensive summary derived from our proprietary trading system. This is Capital Essence’s U.S. Market ETFs Trading Map – SPDRs Sector Report for December 28, 2018. SPDRs Report is the daily, weekly and monthly technical overviews and analysis for major indices, key sectors, commodities ETFs. This information is a comprehensive summary derived from our proprietary trading system.